Savannah-Chatham Metropolitan Police "aided by the US Marshal Service made an arrest today in a shooting that left a 13-year-old boy critically wounded at East 38th and Ott streets on Aug. 2," a police spokesperson says. Jaquan Roberts, 20, of Savannah was arrested without incident at about 7 a.m. during a warrant service at a residence on the 900 block of Seiler Avenue. 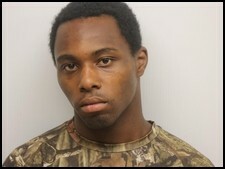 Roberts is charged with aggravated assault and possession of a firearm during commission of a crime.